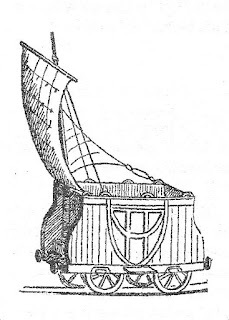 During 1845-6, ex-sailor, Joseph Taylor, struck upon the idea of using sails as a means of propulsion for railway carriages. Taylor ran a provisions shop in Middlesbrough near to the town’s first railway station. In the absence of a Sunday rail service, he used to harness a horse to a railway carriage and haul his family to their place of worship – the Society of Friends Chapel – down the line to South Stockton (the northern end of the modern-day Thornaby), a distance of four miles. 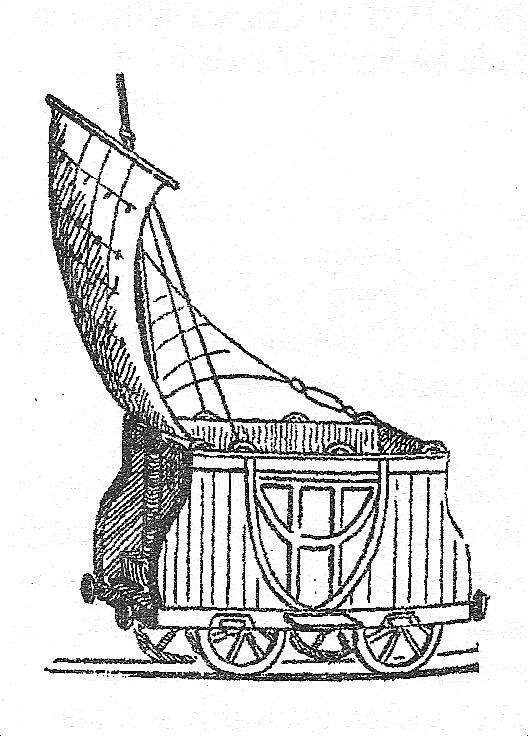 However, when the climatic conditions allowed, he was seen to dispose of the horse and affix a mast and lug sail to the carriage and glide gracefully into South Stockton at a brisk eight knots an hour. Remember, if you'd like to submit a short article for the 'North-East History Tour' then see the link at the top of the page. Anyone can do it! What an odd name for a place of worship: St.Peter-in-Chains Church, Thornaby. Well, it’s actually known by its Latin moniker, St.Peter ad Vincula, if the truth be known – but how many locals know the story behind the strange dedication? The church in question is the settlement’s original place of worship, the site having had a religious edifice of some description since at least the eleventh century. 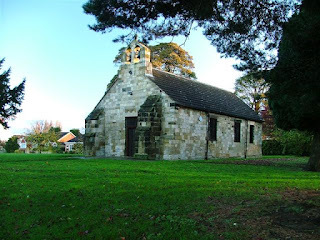 The existing building has its roots in the twelfth century and was originally dedicated to St.Mary Magdalene, but fell from use after the construction of a new church (St.Paul’s) in 1858. However, the old building was renovated in the Edwardian era, after which it became known by its unusual name – though no one seems to quite know why it was chosen. The term ‘St.Peter-in-Chains’ is derived from the Bible’s ‘Liberation of Saint Peter’ (Acts 12:3-19) which tells of how the Apostle Peter was imprisoned by King Herod, but was freed by an angel the night before his trial. In time, the relic of the Chains of St.Peter were taken to Rome where a church (San Pietro in Vincoli – or St.Peter in Chains) was built around them in the 430s AD. That’s not the whole story, but it’s near enough. The idea (for the name, that is) kind of caught on thereafter – including among the good folk of Edwardian Thornaby some 1,400 years or so later. The deserted medieval settlement of Stainsby is a bit of an oddity, sited, as it is, near to thriving conurbations and a busy dual carriageway. There’s not a lot of it left, save for a few lumps and bumps in a field a little to the west of the bustling A19, near Thornaby. With mention in the Domesday Book and its place-name derivation, the village’s roots lie well before the coming of the Conqueror – most likely being founded in the Viking era (from Steinn-by, Steinn’s settlement). It is reportedly shown as effectively deserted on a 1757 map, with only a single farm remaining, but it is not known when or why it was abandoned. As with many such cases, the Black Death or raiding Scots may have been a factor, but it is more likely down to fluctuating populations and/or financial fortunes. Basically, the old place was arranged in two rows of enclosures/plots either side of a central track, though the layout was more complex, or random, than most of its type. Being a Scheduled Ancient Monument, it was deliberately spared when the modern-day A19 was laid around 1970. Intriguingly, though, a WWII pillbox was built amidst the ‘ruins’ when the defence of nearby Thornaby Aerodrome was at stake during hostilities. 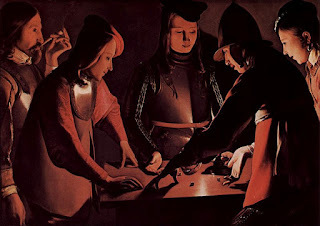 Preston Hall Museum is, arguably, best known for the valuable oil painting called The Dice Players. Usually housed in a special room with dimmed lighting in conditions akin to those of the Mona Lisa, the atmospheric effort of artist Georges de La Tour is one of the North-East’s most prized assets. La Tour was a 17th century French Baroque painter who specialised in candlelit scenes such as that depicted in The Dice Players. Both he and his family died in an epidemic in 1652 – the painting in question being very probably his last work. He was soon forgotten to history, until after World War II, when a revival of interest began. His works, though, were difficult to pin down and/or identify. The Dice Players, for example, was left to Stockton Borough by a local resident in 1930, and nothing much was thought of it at the time. The importance of the canvas was not realised until the 1970s, when it was properly identified. © Copyright Peter and licensed for reuse under this Creative CommonsLicence. The Preston Hall we all now know and love as one of the region’s premier museum attractions was once, of course, a private residence. Built in 1825 to displace the original manor house (which itself was not demolished until 1974), it was rather less grand than the structure we see today. When David Burton Fowler raised the new pile it had little of its ‘modern’ trimmings. In 1882, the hall was sold by the Fowler family to Robert Ropner, a high-profile immigrant shipping magnate. A Prussian by birth, Ropner spent years building up his business in, first, Hartlepool, and then Stockton (from 1888). He moved into politics, where he was Conservative MP for Stockton during 1900-10, was knighted (in 1901) and then raised to the baronetcy. 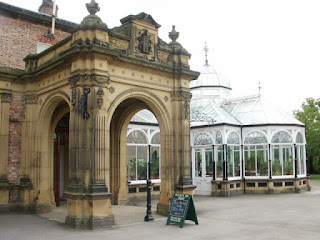 Ropner spent many years developing Preston Hall. He changed its entrance from the river side to the existing position, added a ballroom, as well as an elaborate porch and winter garden/conservatory (latter two illustrated above). He also constructed many of the estate’s outbuildings for his staff and servants. Sir Robert Ropner died, aged 85, in 1924. The family lived on in the house until 1937, and it eventually passed into the hands of Stockton-on-Tees Council in 1947. It then re-opened as the borough’s museum in 1953. The museum is presently undergoing a multi-million pound facelift, and is set to reopen in the Summer of 2012. In the NW corner of the newly-developed area of Ingleby Barwick lies an expanse of open ground. Beneath the same – and spread liberally under the surrounding houses – are the remains of the most northerly villa of the Roman Empire. A few years ago, planners gave the nod for expansive housing construction in the open fields to the south and west of the original village. However, before the bulldozers moved in some tentative archaeological investigations were carried out – and they made the amazing discovery. Furthermore, they found a good deal more historical stuff under the surface going back to prehistoric times. What was eventually termed a ‘Romano-British villa’ was unearthed near to what used to be Quarry Farm. It all happened during 2003-04, and such structures as a heated room, aisled building and field enclosures were laid bare for a short time – until the construction workers returned. The best bit – a winged corridor structure – was, however, left buried, and a decision made to build around it. The said remains lie under the eastern extremity of the grassed area. The complex is thought to date from c.100-150AD, and may have remained in use until as late as c.450AD. Many have often wondered how the now merged settlements of Egglescliffe and Eaglescliffe came into separate existence. Such similar names – how strange! I’m not sure anyone knows the answer for sure, but here’s the generally accepted theory. Let’s get one thing straight: Egglescliffe (to the south) has been there for at least 1,000 years. And look on the OS map of 1857 and you will find no sign of Eaglescliffe immediately to the north. All you’ll see is a newly-built railway feature called Preston Junction. The railway line which ran through this part of the world was, of course, the famous 1820s effort, the ‘Stockton & Darlington’. Originally, however, the course of the line was a little to the east of the 1857 (and present-day) affair, and ran through the developing Preston Hall/Park estate. The estate’s owner wasn’t best pleased about this, and made the railway owners re-align the track to run on the other side of the main road in the early 1850s. Coincidentally, another, newer, line was also being laid at this time (coming north from Northallerton), so there was (and still is) a two-mile stretch of parallel lines running north from Egglescliffe. This was quite handy, as it gave the railway developers a chance to drop a new station into the gap between the two lines to act as an interchange – and it seems to have been originally called ‘Preston Junction’. However, due to the inconvenience of having to move their line, the Stockton & Darlington owners decided to quickly rename the spot ‘Egglescliffe’, after the nearby village. Apparently, though, when the telegram was sent to the sign-maker, he somehow substituted an ‘a’ for a ‘g’ (or perhaps did so deliberately, thinking the instructions were in error), and the name of the new station became ‘Eaglescliffe’ – a place which didn’t even exist at the time! Eventually a new settlement grew up around the stopping-off point which, in turn, adopted the corrupted name. Well, that’s the story, anyway. The holiday launchpad we now know as Durham Tees Valley Airport began life as ‘RAF Station Goosepool’ in 1938. As hostilities commenced and escalated in the following years, the airfield was upgraded and renamed RAF Middleton St.George in January 1941. It was the most northerly bomber station in the British Isles. Raids on the Tirpitz, as well as attacks on the likes of Hamburg, Berlin and Dresden (and many more besides), were launched from the site during WWII – resulting in the loss of more than 1,000 airmen who were based there. After the war, the bombers left and the fighter planes took possession of RAF Middleton. However, in 1964, budget cuts led to its abandonment. Cleveland County Council then stepped in, keen to make a commercial go of a civil airport. It was then (in 1966) that it became known as ‘Teesside International Airport’, and over the next four decades it slowly but steadily grew in size and importance. A change of ownership in the early 21st century saw a name change to ‘Durham Tees Valley Airport’ (in 2004) – and, it has to be said, a dramatic dip in its fortunes followed. Redevelopment plans failed to reach fruition as passenger numbers began to fall – in fact, from a peak of 900,000 passengers passing through the airport in 2006, the annual footfall now stands at less than a quarter of this figure. It is difficult to see how the venue can survive as a commercial concern. The Sulphur Well was accidentally discovered in 1789 by labourers employed by the late Mr. Lambton in searching for coal. The men had bored to the depth of seventy-two feet, chiefly through red rock and whinstone, when the spring burst forth with a tremendous smoke and sulphureous stench. The remarkable qualities of the water attracted the attention of the labourers, who dug a hole in the channel of the spring for the purpose of bathing, and one of them, who had long been afflicted with chronic rheumatism, was perfectly cured by the bath and drinking the water. Though under no medical rule or regulation, the extraordinary effects of the water, particularly in chronic rheumatism and cutaneous disorders, added daily to its celebrity. A cold bath was built in 1797, and a warm bath has since been added. The Dinsdale Spa has gradually become a place of great resort, and the little village of Middleton, a quarter of a mile below the Bath, has been sometimes crowded with visitors. From experiments, a wine-quart of the water contains carbonate of lime 2 grains, sulphate of lime 25 grains, carbonic acid gas 2 cubic inches, azotic gas 1.50, sulphurated hydrogen gas, which contains 2½ grains of sulphur, 8.32. The large quantity of hepatic air is most remarkable, and probably exceeds the proportion in any medicated water of which the analysis is before the public. The separation of sulphur is so copious, that large quantities may be collected out of the channel of the spring. The water is clear and sparkling at the well-head, but gradually becomes opaque as the sulphur separates from the gas. Like most hepatic waters, it leaves a slight sweetness on the palate. The stream, which issues through a very small bore, flows twelve gallons in a minute; neither weather nor season make any observable alteration in quality or quantity. On applying the bulb of the thermometer to the stream as it breaks into day, the quicksilver stands at 52, eight degrees above the temperature of the neighbouring springs. About two miles up the river are the remains of an old Bath; the water is slightly hepatic and saline. In time, Dinsdale Spa fell from favour. It’s potential, however, stretched deep into the 19th century, with the construction of Dinsdale Station to accommodate the anticipated passenger traffic from the new-fangled railway system. Nice images here and here.